The Likely Suspects: The stars of Richmond short track racing include Denny Hamlin, Kyle Busch, Jeff Gordon, Clint Bowyer, Tony Stewart, Ryan Newman, Mark Martin, Jimmie Johnson, Carl Edwards and Jeff Burton. My 2 Cents: There are a variety of good picks this week. However, you'll want to focus your final picks on where they start. 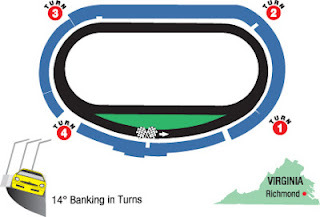 Track position is key at Richmond. In fact, 90 of the 113 (79.6%) NASCAR Sprint Cup races at Richmond International Raceway have been won from a top-10 starting position, including 22 from the pole. So my definites are a three-way, no brainer tie between Kasey Kahne, Kyle Busch and Clint Bowyer. Tony Stewart should be a great pick too, but I just don't trust this team for performance right now. Mark Martin is my next choice. He could very well earn me some qualifying points. I will finish up my team with Ryan Newman, Carl Edwards, A.J. Allmendinger and Ricky Stenhouse Jr.